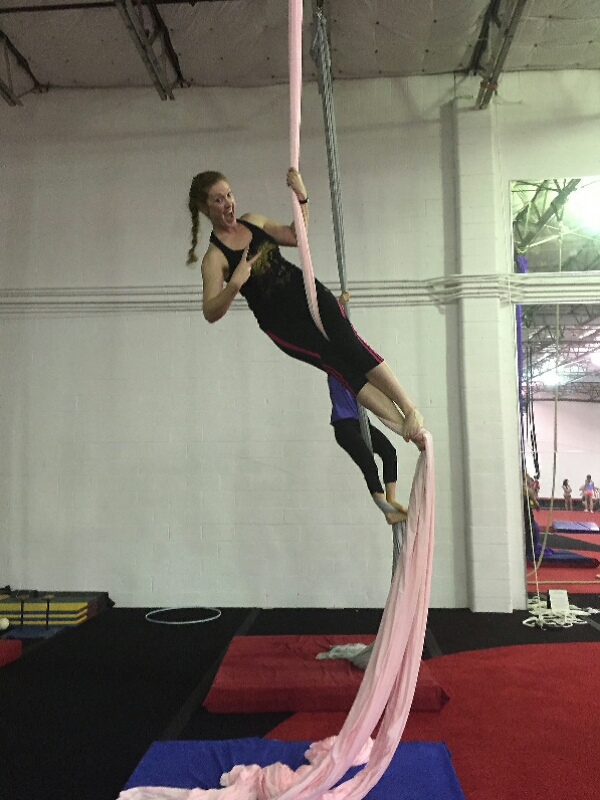 Ok, so tonight was my third Aerial Silk (Tissu) Class. I bought a set of 4 from Groupon completely on a whim. I was under no delusions when I showed up at the circus that first time. I remember standing by the silk and listening intently on the instructor “Kelli”, going over safety issues and such. Then she spoke the two dreaded words, “Let’s climb”. Err do what? Me climb up this piece of silk? HA HA HA. So I tried, and tried. Next day I cried and cried (from the soreness in my arms and chest). Now, think about the rope in gym class, nope I couldn’t do that either. In retrospect, I actually did surprisingly well in some of the beginner movements Kelli showed us that first week. I think I impressed myself as I approached the motions with a sense of fearlessness. But the climbing? “I will do better next week”, I mused. Week 2 rolled around, I approached the silk, ” let’s climb!”. I put my feet in the appropriate position and pulled again, hmm off the ground with arms quivering…annnnd down. Repeat. Ok, I’m not going to let this defeat me. I must get stronger. This is when I decided to start with the pull up/chin up and handstand work. In class tonight, I approached the silk with a certain confidence. I will climb. And climb I did! The sense of accomplishment was pretty amazing. My friend took a photo. Don’t I look excited? !